We are wishing a happy 115th birthday to German theoretical physicist Werner Heisenberg! Philosophical Library is celebrating a key contributor and pioneer of science and philosophy. Today, we are wishing a happy 115th birthday to German theoretical physicist Werner Heisenberg! He was born on December 5, 1901 in Wurzburg, Germany to his mother and father, an educator. Werner began his studies in physics and mathematics when he was nineteen years old at the Ludwig-Maximilian University of Munich as well as the University of Gottingen. At the latter, he studied physics and mathematics and received his doctorate from the former in 1923. He held a great interest in quantum atomic physics and attended lectures on the topic. By 1924, Werner Heisenberg went on to research with Niels Bohr, the director of the Institute of Theoretical Physics at the University of Copenhagen. His paper, “Quantum Theoretical Reinterpretation of Kinematic and Mechanical Relations” was published a year later. After his return to Gottingen, he developed the matrix mechanics formulation of quantum mechanics. In 1927, Heisenberg developed his Uncertainty Principal while in Copenhagen. That same year, he became a professor of theoretical physics and head of the physics department at the University of Leipzig. Werner Heisenberg received the Novel Prize in Physics in 1932 for his Uncertainty Principle, though he had been previously nominated in 1928 by Albert Einstein. He did come under attack, however, during the reign of Adolf Hitler. Heisenberg was criticized and investigated for teaching about the roles of Jewish scientists. This was later resolved, though public attacks against theoretical physicists, including Heisenberg, remained. Heisenberg went on to become one of the leading German scientists during WWII and served as director of the German Uranium Project developing an atomic bomb for Germany, though his efforts were not successful. He was later jailed for a year for his role in the Nazi regime. 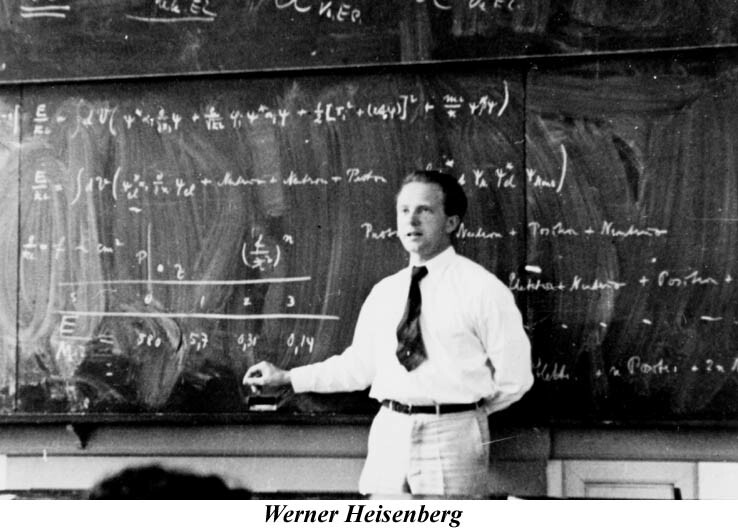 Werner Heisenberg continued his contributions to the field of nuclear physics for the remainder of his career, teaching, researching and lecturing around the world. His findings are still highly regarded to this day and are accessible to anyone interested in his work. Nuclear Physics by Werner Heisenberg is a compilation of lectures from the author himself on the topic of nuclear physics and provides an in-depth look into the study of the atom. Beginning with a brief history of atomic physics, he later delves into the theory of the processes and reactions within the atom itself. A quintessential read for anyone looking to understand the atom, Nuclear Physics provides a scientific explanation from one of the greatest minds of the twentieth century. To purchase this title, please click here.